Another Wednesday, Another Sketch!! I love the middle of the week!! 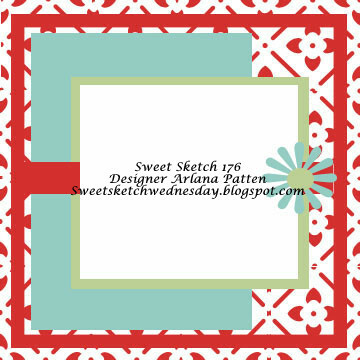 Monday is history, the Weekend is coming up... AND... it's time for a great new Sketch at Sweet Sketch Wednesday!! 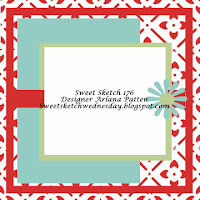 Our Sponsor this week is Digi Stamp Boutique. I chose the image James Fishing! I used papers from my stash - love when that happens =), twine from the Twinery and a Prima wooden button. The image is colored with Copics and the edges distressed with CtMH Chocolate ink. The sentiment Boy oh Boy is from LotV. Hope you will join us this week - I can't wait to see your creations!! Hi Sally I love James and his fishing trip at least he caught a fish and it's not a fishing story that it got away LOL. This is such a cute masculine card. Love your papers and colours and great embellishments. Take care and have a lovely week. We have all kinds of fish stories at our house...non as cute as your card! Great coloring and perfect masculine papers. Have a great week. There we go, another crafter not afraid to plunge into the world of masculine cards!!!!! Hehe! It's adorable Sally. Love your image, coloring and sponging. And yes, it's fantastic when you can dive into your scrap bin. Such a cute image ... I'm proud of you that you were able to use scraps. I get downright giddy when I'm thrifty like that. I REALLY love your masculine card. Sally, this card reminds me of my dad and truely put a smile on my face when I saw it. I love this image. I really think it is one I am going to have to get. I love how you colored it up. Gorgeous job!!! Have a lovely week. 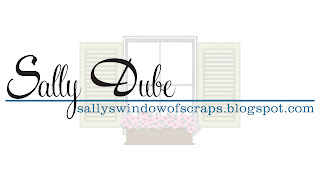 Sally, this is just adorable! Love it! I love using up bits and pieces of paper as well. I love the image you used, it is so cute! Thanks for becoming a Follower Sue!! simply adorable...and manly...and yummy! i love those colors...and that darlin image! reminds me of dh...and his fishing days! nice touch with the heart embellie and lil bow! So cute! Love his rosey cheeks and the plaid paper and twine!